Friday 22 April 2016 saw the annual Nottingham Charity Varsity Series plant its feet firmly in the calendars of students and staff after a nail-biting opener. Filling the Motorpoint Arena with over 5,000 roaring fans, women’s basketball kick-started the series with one of the fiercest encounters in Varsity history. 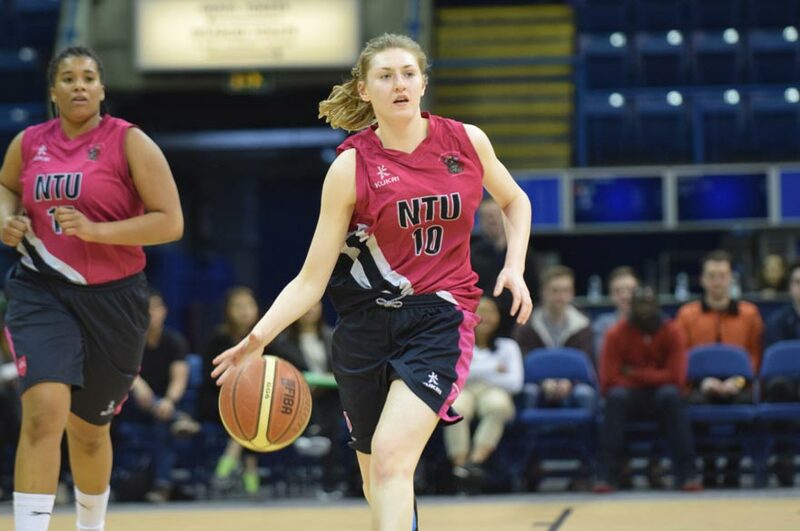 In previous years, NTU’s Women's Basketball have regularly succumbed to the overwhelming force of the University of Nottingham (UoN) side. But this year the first team have gone from strength to strength – winning their BUCS league with a whopping +529 points difference and securing promotion to Midlands 1A before being crowned Conference Cup winners. With the tail wind of a league promotion and cup success behind them our girls in pink came out onto the court with a look of sheer determination – hopeful of adding a Varsity win to their medal pile. NTU began strongly and led all the way through to half time, but after some strong words during the break, UoN came back with a vengeance, nipping past NTU to win the game 43-57. Next up was the men’s game, with NTU Men's Basketball going into the tie off the back of an up-and-down season – finishing mid-table in Midlands 2A and making it through to the quarter-finals of the Conference Cup. With such mixed form, many supporters were cautious as as the underdogs from NTU came face-to-face with their UoN rivals. On paper, the Green and Golds were a considerably stronger side, finishing third in Midlands 1A. What followed, however, caught everyone by surprise. From the very first tip both teams made it their mission to be the ones lifting the coveted trophy. With points being traded back and forth between the sides, not a single minute of play went by without the players forcing the opposition into errors and those all-important penalties. The final quarter of what was a thrilling encounter saw the sweat fall not only from the teams but from the nervous crowd as well. With just four minutes on the clock a very tired NTU outfit were down by eight points and staring defeat in the face, but in a dramatic finale, they fought their way back – buoyed by a passionate crowd – to take their first Varsity win since 2011, by a slender 76-74 score line. Still reeling from the electric atmosphere, NTU and their cross-city rivals then turned their attentions to the very first Super Wednesday. A new addition to the series this year, Super Wednesday sees the universities do battle over a day of individual sporting events, with the overall winners being awarded a precious point. Beginning in Beeston, spectators were treated to showcases of Canoe Polo, Water Polo, Trampolining, Tennis, Golf, Archery, Dodgeball and Fencing. Unfortunately, it was UoN who seized on their home field advantage, claiming victory in all but one of the fixtures and securing their second point of the series to take a 2-1 lead in the overall standings. A disappointing result, sure, but an exciting opportunity for teams to make their mark for the first time in the history of the series well taken, and a special congratulations to NTU Archery who beat their rivals in an extremely close game. Now we look ahead to the array of treats that the May bank holiday has in store for us beginning with NTU American Football, who step up to the mark to begin their Varsity campaign at Lady Bay under the Friday night lights. This year in an American celebration spectators will be treated to some very special half-time entertainment too, so make sure you don't miss out on what is expected to be another edge-of-your-seat encounter. The series then takes us poolside as the Swimming gets under way on Saturday 30 April over at University Park. Cheer on our boys and girls from 2 pm. The final fixture of the bank holiday weekend takes us back to Lady Bay for rugby union, where NTU Women's Rugby Union will kick off the day’s proceedings at 1 pm before the men take the field at 3.30 pm. So with plenty on offer, why not make the most of the long weekend and help cheer your team to victory in the next instalment of the Charity Varsity Series. To read the full match report from the Men’s Basketball visit our News pages. To see a full list of fixtures for the series visit our Varsity pages. Follow us on Twitter to keep up to date with all the score.